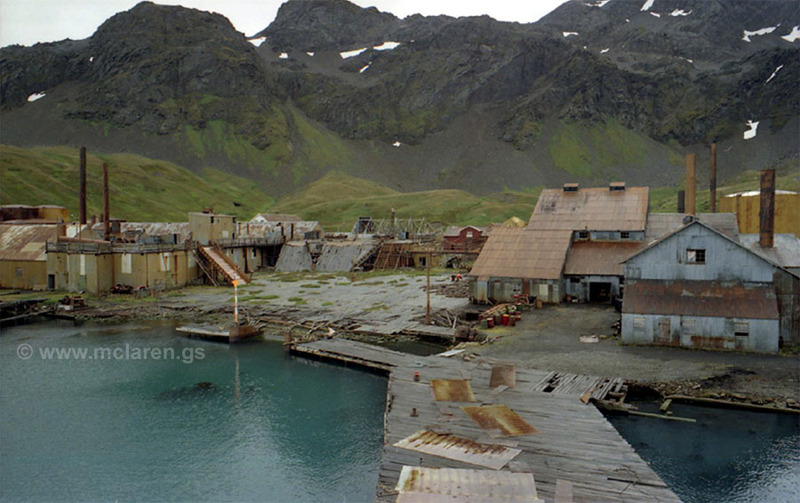 Grytviken, (Cauldron Bay) the oldest of the whaling stations, was founded by Captain Carl Anton Larsen in 1904. On arrival in the bay or viken, the whalers found some old tri-pots (gryte) that had been left by earlier sealers. This was later to be commonly known as Pot Harbour, but is technically incorrect as the Norwegian for harbour is havn. The Louise was purchased to transport the factory buildings and accommodation down to South Georgia from Sandefjord. After the first cargo arrived, the station was up and running within five weeks! 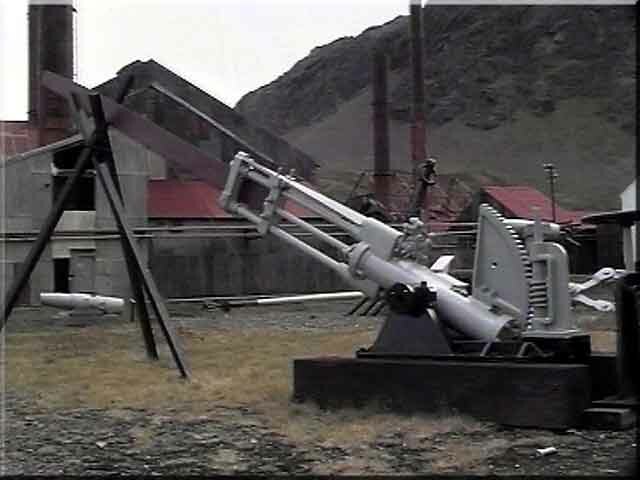 Grytviken has some of the most photographed landmarks on South Georgia. The Whaler's Church must be at the top of the list. A lovely old building dedicated in 1913 and still in use today. A short walk from the church and you are at the Cemetery and can view the grave of the explorer Sir Ernest Henry Shackleton. The ex whale catcher Petrel is another favourite, as are the hulks of the Dias and the Albatros. The South Georgia Museum is housed in the old Manager's accommodation, where relics of the whaling era can be protected for posterity. 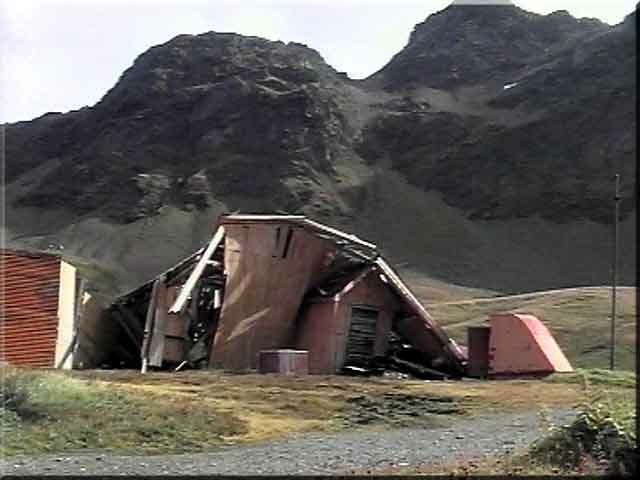 Over the eleven years I saw a few of the whaling station structures succumb to the elements, one of them being the Grytviken Kino (cinema). The Flensing Plan wooden deck sheathing has almost completely rotted away. Considering that it has been over thirty five years since any of the factory and accommodation buildings had any maintenance, it shows the high calibre of the men who built them. Above the Machine Shop is the Patternmaker's Loft, still containing many beautifully made wooden patterns, ready for the Foundry to make castings for new parts. A legacy of the conflict in 1982 can be found on the hill about a mile away from the Cemetery, in the form of a Puma helicopter. 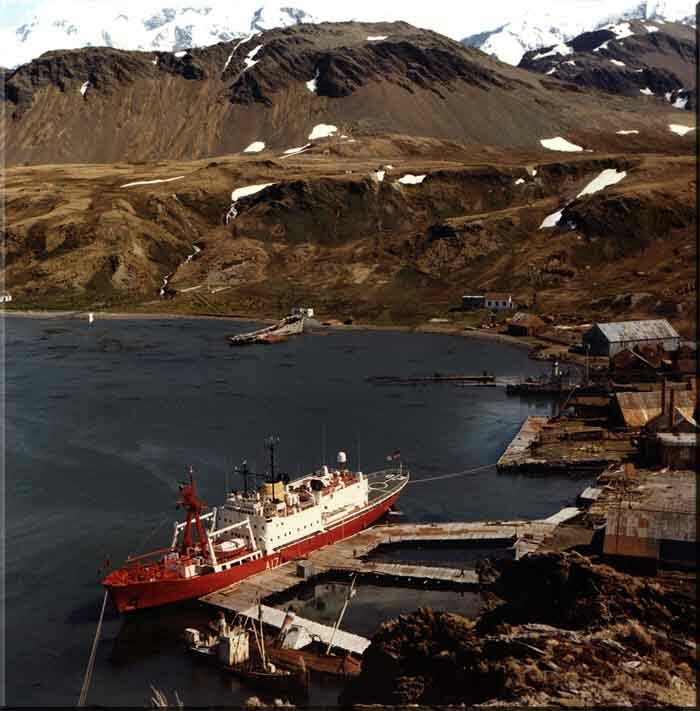 There is also a lovely photograph of HMS Endurance at Grytviken, taken a year or two before the conflict. Life on a whale catcher or sealer was very tough as the following extract from a letter written to the Colonial Secretary, Port Stanley, by the Administrative Officer, South Georgia shows. "It appears that all three of the whaling Companies fall short of the standards set in the UK Life Saving Appliance Rules,1952, in various ways in respect of their whale and seal catchers. The living conditions aboard the Pesca sealcatchers are, I should hazard a guess, among the very worst to be found at sea anywhere in the world to-day. I have been out sealing in the "Dias" for a week and the "Albatros" for 6 days and also in the "Petrel". The crew's quarters are grossly overcrowded and they stink and reek of rotting seal blubber as it accrues in the holds from voyage to voyage and the smell seeps through into the mess. My bunk in the "Albatros", which was one of the best in the ship, was soaking wet all the time that I was out, so I slept clothed and in an oilskin. Sea water and oily blood dripped almost continuously and occasionally poured through the deck head into the after mess where I was accommodated. Both these sealers have a penthouse on the after deck, which is unapproachable in rough weather, but in which is housed the ship's lavatory seat. Flush arrangements are not provided. Nor do wash basins in these ships. Conditions being what they are, the crews rarely change their clothes or wash. Some do not change their clothes for 2 months. Food and pay are good." My thanks go to Ann Kristin Herfindal for the insight into the Norwegian language, research into the origins of the name Husvik, and information about the Whaling Museum in Sandefjord, Norway. 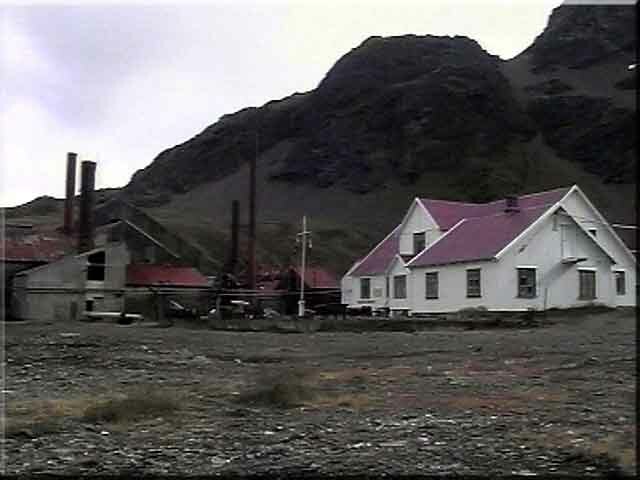 The original factory buildings and the Manager's house at Grytviken had been prefabricated in Sandefjord. 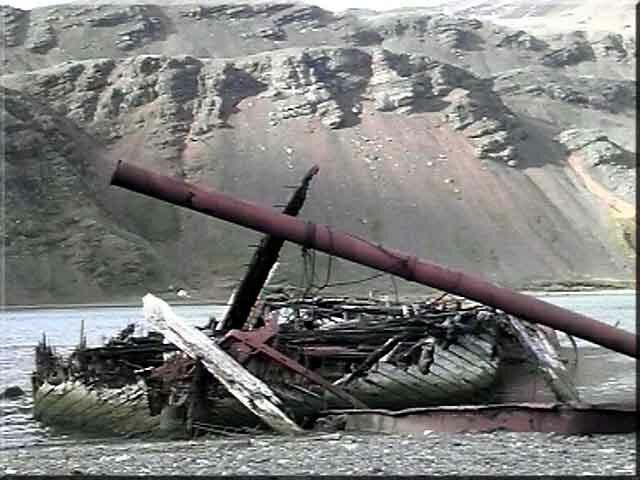 The hulk of Louise, the original supply vessel used by Captain Larsen. A "Cape Horner", she was built in 1869 in Freeport, Maine, as the barque Jennie S Barker. She was to be renamed Louise in 1880. Louise brought the first two factory and accommodation units down from Sandefjord, in mid 1904. She served as a stores hulk till sinking in the mid 1920s. H.M.S. Endurance at the harpoon jetty in Grytviken. The photograph was taken over thirty five years ago and is of the original Endurance (ex Anita Dan). 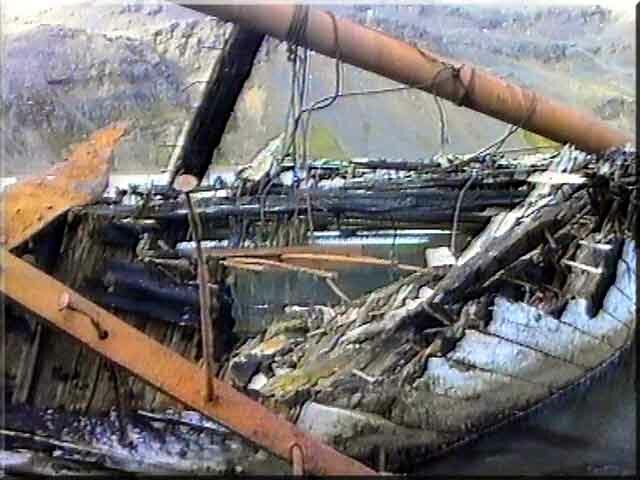 The whale catcher Petrel (centre right) is still afloat, and the hulk of the Louise (centre top) is still in one piece. The photograph is from Barry Scott's collection - Royal Navy photograph. 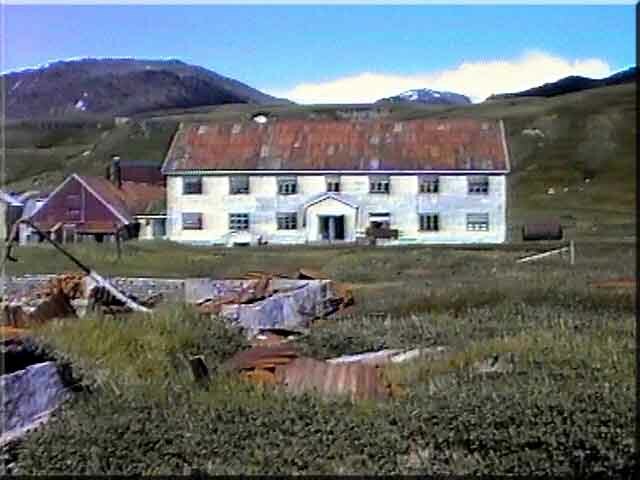 The Manager's accommodation at Grytviken, refurbished and repainted, it now houses the South Georgia Museum. Outside the new Museum building are exhibits from the whaling days, tri-pots, harpoon guns and various implements associated with the whaling industry. This is a steam driven bone saw which would cut up the head and spine of the animal in the Bone Loft. This was also cooked and after the oil was extracted was turned into bone meal. The Boiler House is seen in the background. 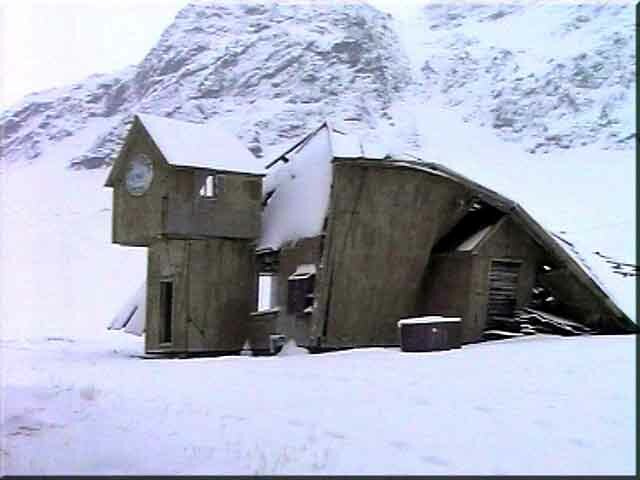 The whaler's cinema, the Grytviken Kino. On my first visits to South Georgia the cinema was in a state of advanced decay. Seen here straining under the weight of snow on the roof. The next Summer saw a further collapse of the building and on my next visit it was completely flat. From outside the Church, the Barrack block is seen to centre of the picture and the Mess Hall to the left and joining it. The foundations of the now defunct cinema can be seen in the foreground. 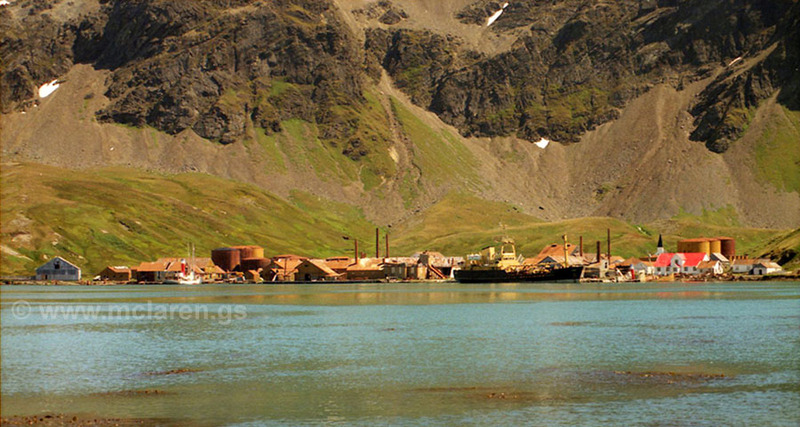 Grytviken with “RMAS Throsk” to the right of centre. Throsk was there to take part in the clean up of the oil tanks to prevent any possible future contamination. Looking on the Plan Deck from the Harpoon Jetty.